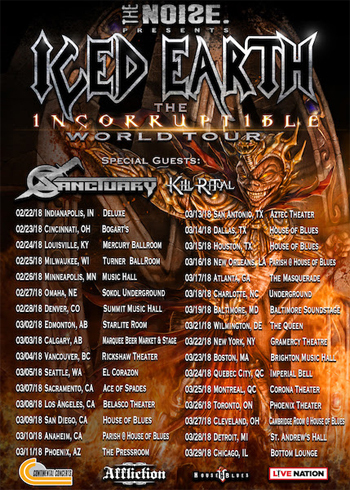 Metal giants ICED EARTH are excited to reveal plans to bring their "pure and absolutely incorruptible heavy metal" (Rock Hard Italy) to fans across North America as they announce details on their "Incorruptible" World Tour in 2018. "Brothers and sisters! We are very aware at how impatient you have been getting about our North American tour announcement, but the time has arrived!! We will be seeing you soon in a very extensive USA/Canada run. Be there, it will be an awesome time for sure!"